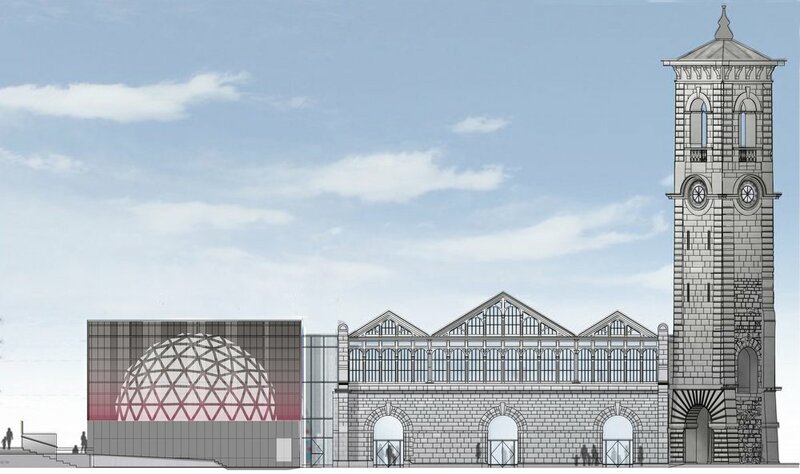 Market Hall in Plymouth is set to become a landmark hub for the digital industries, and to include an impressive 360 degree immersive dome. HemingwayDesign was asked to lead on interiors and branding, as well as make recommendations towards cutting costs without compromising design. The aesthetic, affectionately named “cosy industrial” by our client, the Real Ideas Organisation, is a juxtaposition of original yet defunct industrial features with clean, contemporary, yet softer interventions. These were to be thrifty… with the right addition of warmth. Materials include recycled wood wool, and acoustic felt bonded to corrugated plastic. The ground floor will be strongly linked to the local community through its restaurant, whose bar counter doubles up as a welcoming reception to visitors. 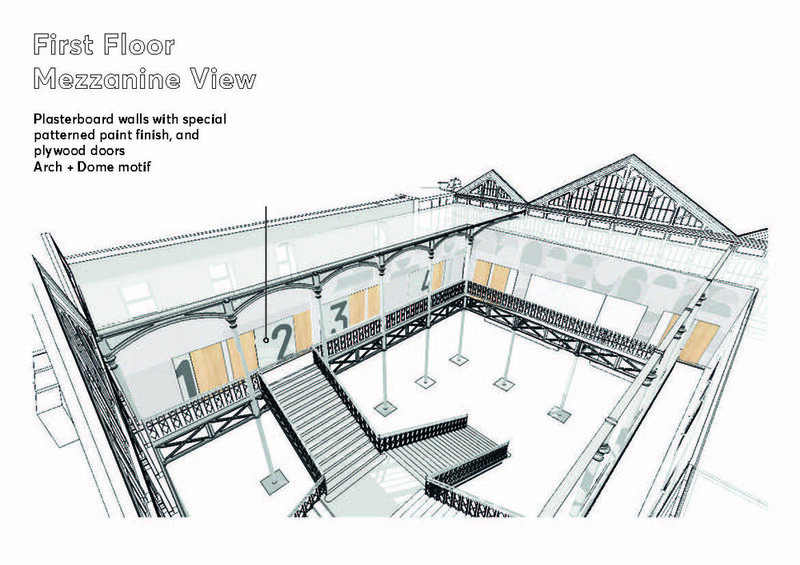 The main historic Market Hall is to serve as an events and evolving exhibition venue. 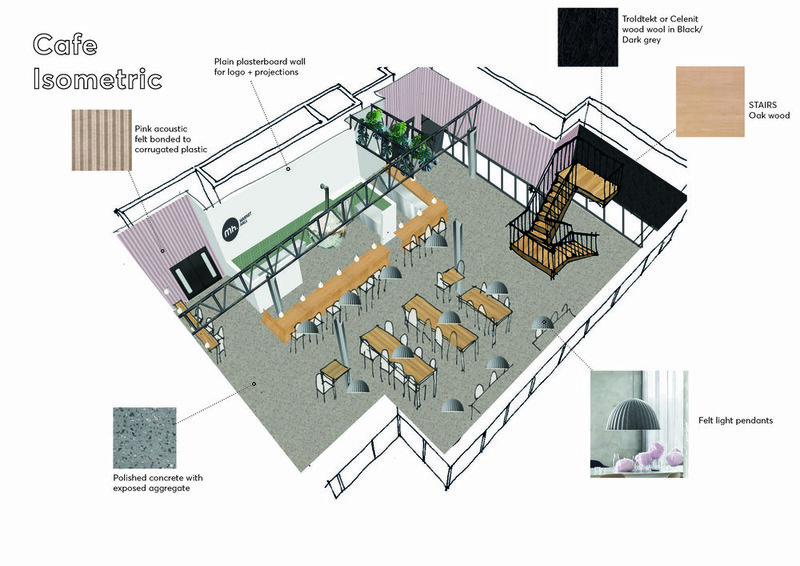 The co-working hub within the mezzanine is to use a tiered membership service. It includes a print hub, hot desking areas, collaborative pods, quiet booths, private offices, lockers, a post point and breakout areas. When considering environmental graphics, we took inspiration from the existing geometry of the original historic fabric as a reference for pattern and shape.